Nick Fury, as played by Samuel L. Jackson in the recent Marvel movies is one of the best revisions of a character in comic book history. He's always been tough, and had the eye patch, though he used to look more like J. Jonah Jamison in tights, down to the half-eaten cigar and white wings in his hair. He's a hard man to pin down. He's a soldier, a spy, a mercenary, a hero and an anti-hero, all rolled into one man. There are sacrifices he's willing to make, to protect his vision of right. Careful. You might be one of them. I was so happy when Jackson got the role. No one does dangerous like Jackson. The writers really got the "wheels within wheels" intrigue of the character, and Jackson understood the manipulative nature of the man, whom we hope is still on the side of right in his heart. Samuel L. Jackson is one of the best actors ever. I'm sure he'll do it proud. 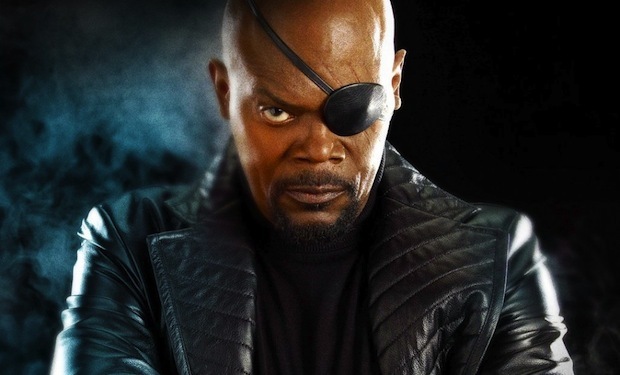 I love Nick Fury as played by Samuel L. Jackson. I don't really know his character in the comic books, though. These days, I think the comics are influenced by them movies. He's even drawn differently now! SLJ is such a good actor, he could probably play any super hero. He was also a fantastic villain in Kingsmen! I love Samuel L. Jackson as Nick Fury! It's kind of weird for me to picture the character as anyone different. Samuel L. Jackson was a great pick at Nick Fury. He's nailed the role.